The Future of Web Development - Role of Machines? 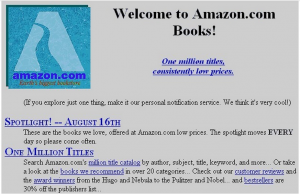 This is what Amazon.com looked like in the 1990’s. Web development has been changing radically for years. I remember when I first started doing web development in the late 90’s through to early 2000’s. At that time almost nobody had a web site except for large companies. Basically, just having a site no matter the design was a huge plus. Today as we work with clients, it boggles my mind at how that is not even a question now. Everybody has a site these days. In fact most site today are really well designed and even pleasing in their user experience. In no small part this is a result of the CMS world which has given us WordPress, Drupal, Joomla, and a slew of other smaller ones. They are easily integrated with social media (with some minor modifications) plugins. These CMS’s have created a new reality that benefits the end user and SMB’s, but not the developer community. As early as 2005, a flood of cheap developers from third world countries just entering the global markets resulted in an increase in supply of willing developers to work for wages as low as $2 per hour. You may say, that “my company doesn’t compete with these developers because we offer a different value.” This is almost always the answer web firms deliver to differentiate themselves from that market segment. However as true as that may be in theory, the reality is far different! That segment has dramatically changed the rates of freelance developers working in the US. As an experiment you can try to put a job on craigslist for a full stack web dev, that is also local to your area. Set the hourly rate to $10 per hour and see how many qualified responses you get. All this translates into a sort of commoditization of the current day web developer. This adds increased market pressure on smaller and medium sized agencies. Businesses are becoming more acutely aware of the true value (or lack thereof) that large agencies bring. WEB DEVELOPMENT That was then, and this is now. In todays web development, even the $20 per hour developers are having a tough go because the ease of use that WordPress has created. Many companies are just deciding to go at it alone, or use the myriad of training tools, YouTube videos, and sites like css tricks. They are willing to bring in a person to change themes and create add-on’s but these have become minor web development expenses. There are still developers of course that make the large sums of money that were once promised them, especially in the cloud computing, Python, and Java, RoR and other mobile related platforms, but even these developers are at risk of feeling the numbers crunch them as more applications are released to help make mobile apps from a set of pre configured options. Does this at all sound familiar? Well it should as this is exactly what happened to desktop web developers between the start of the millennium and 2010, due to out of the box CMS’s. Its not all doom and gloom though. When WordPress eradicated the previous web developer (Homo- Desktopus), it also created (evolved) a new type of developer (Homo- Responsian) focused on mobile and responsive designs. This also led to the extension of that progress in storage and networking needs, which also created a need for a new type of cloud developer (Homo-Cloudepis). This comes down to nothing more then evolution of web development. While we give away more and more of our unwanted and lower quality jobs to machines and software, we also create new industries where humans still need to chart the path. Some aspects of web development are being normalized through out all developers. For example SEO! I would argue that today most developers know more about SEO principles that in the decade past, and the next decade will incorporate those principles even more.